Paul Mealor’s short Now sleeps the Crimson Petal consists of four linked madrigals on texts referring to roses either directly or as a metaphor for love. The eponymous first song sets a sensual poem by Tennyson in which the closing of flowers as night draws on suggests the union of two lovers. 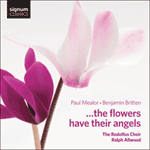 The setting is delicate and reflective but exploits the full range of the choir’s vocal resources. Lady, when I behold the roses sprouting uses a typical English madrigal text, paraphrased from a 16th-century Italian original. The play of dual tonalities expresses the poet’s flattering confusion: is he seeing his lady’s red lips or the petals of a rose? Upon a bank with roses set about contrasts a peaceful pastoral idyll with the sharp pain of a thwarted lover. Fast-moving and quiet, the music evokes a murmuring brook with micro-polyphony and rippling lines, interrupted when the voice of wounded Love is briefly heard. The final poem, a setting of the Christmas text A spotless rose, is the emotional heart of the cycle, recalling the musical material of all the other three movements. An aural depiction of the petals of a rose unfurling culminates at the words ‘fairest bud unfolds to light’, and the cycle comes gently to rest on a rich B major chord. O grievous to be spoken.